The driver of a Pound Stretcher lorry has just commenced a marathon 20-minute overtaking manoeuvre on the M42. The lorry driver is attempting to overtake a Fred Sherwood lorry while, at the same time, causing maximum inconvenience for other motorists. The driver of the Pound Stretcher lorry is forty-six-year-old Phil Hardman, from Chester. He had been checking his mirrors for the last few miles, waiting for the optimum time to commence his overtaking manoeuvre. Upon seeing a black BMW approaching fast from behind, he pulled out without indicating causing the driver of the BMW to decelerate from 110mph to 50mph in just a few metres. The driver of the BMW, twenty-nine-year-old salesman Mark Baggage, gave the custom blast of his horn, shaking of his fist and barrage of abuse but this only made Phil slow down further. The two lorries have been side-by-side for the last 10 minutes, and are expected to prolong the manoeuvre for another 10 minutes at least. 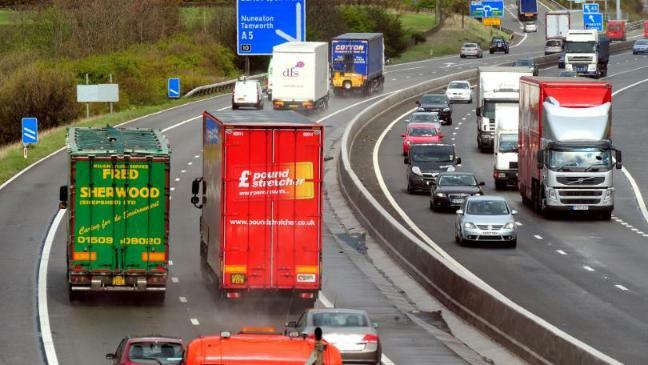 The queue behind the lorries now stretches back several miles, past Junction 10 of the M42, and road users are advised to avoid the area and find an alternative route. The irony for enraged motorists is that Phil isn’t actually delivering anything today. He has just taken his Pound Stretcher lorry out onto the roads to annoy as many motorists as he can.